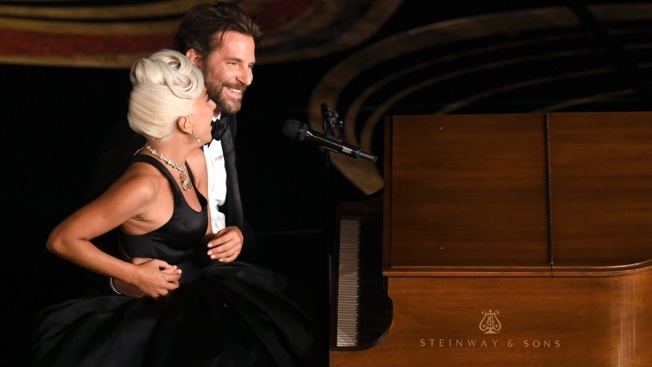 In this Feb. 24, 2019, file photo, (L-R) Lady Gaga and Bradley Cooper perform onstage during the 91st Annual Academy Awards at Dolby Theatre in Hollywood, California. It was acting, not love, when Lady Gaga and Bradley Cooper sang a duet Sunday at the 91st Academy Awards. Gaga discussed the emotional performance of "Shallow" from their film "A Star Is Born" during an appearance Wednesday on ABC's "Jimmy Kimmel Live ." The duet led online posters to say the stars are in love. The artist rolled her eyes and called social media "the toilet of the internet," saying it has hurt pop culture. Gaga said, "Yes, people saw love and guess what, that's what we wanted you to see." Gaga says it was a love song in a love story and they had "worked all week on that performance." She said, "I guess we did a good job. Fooled ya! Gaga brought her Oscar for "Shallow" to the show.